As Mulan and Tarzan are still relatively well-regarded, Fantasia 2000 and Dinosaur were set apart by being strange experiments and The Emperor’s New Groove is one people tend to be on the fence over, Atlantis tends to have the unenviable place in the Disney canon of the one people can point at and go, There! That’s where Disney’s ‘difficult’ period started! Usually then looking at Lilo & Stitich the year after and adding, Yeah, well, Lilo & Stitch is a weird anomaly. 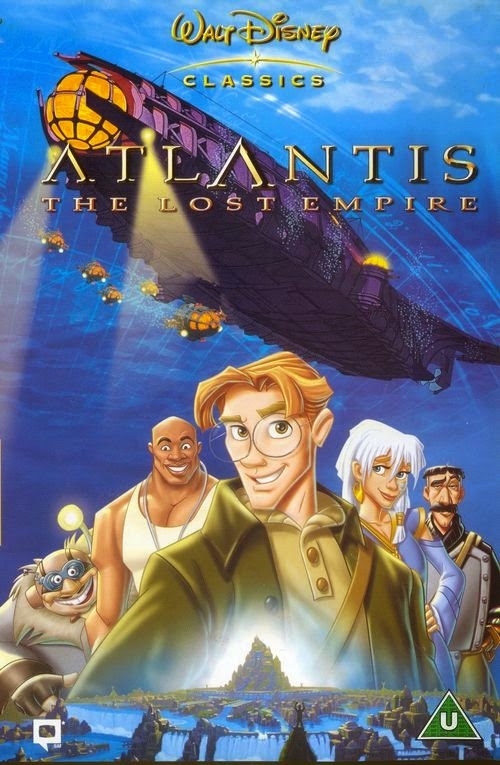 It’s true that Atlantis is probably the point that Disney was most visibly slipping out of its ‘renaissance’ return to glory. Ironically Disney’s most dry film, it has no songs, very few bright colours and comic relief only in an incredibly sarcastic switchboard operator, a deadpan demolitions expert and a dirty, perverted and creepy Frenchman. It aims for childlike wonder in the Jules Verne mould but by only packing the well-trodden story of a single half-hour cartoon – young dreamer is taken to magical city by mercenaries only for them to turn out to want to plunder the place – it ends up rather dull. Very unusually, I didn’t even want to finish it in a single sitting. I didn’t catch Atlantis at the time, and really felt very little attraction to it. In the years since it came out, I’ve mostly heard about in the context of ‘You know how The Lion King ripped off Kimba? Yeah, well, Atlantis ripped off Nadia! And Laputa too!’ Honestly, I don’t see it – the ideas that are in both are pretty ubiquitous adventure story elements and staples of adaptations of Verne works, so I can let Disney off the hook on this charge...not that I’ve seen more than two episodes of Nadia, mind you. Yet! There’s a lot about Atlantis that appeals. Getting a left-field artist like Gerald Scarfe in to design characters had worked nicely on Hercules, so having Hellboy creator Mike Mignola work on this film seemed like a good bet – and there are some great designs here. The cast is strong, with big names experienced in animation putting in good work – Michael J. Fox is very much at home, and Leonard Nimoy’s rumbling patriarch plays to his strengths rather more than Galvatron did. Cree Summer also appears as the poster girl, the veteran putting in an excellent performance – and though she’s one of the very first voice actresses I ever took an interest in (through her work in Inspector Gadget and Rugrats), she certainly isn’t always spot-on...I’ll never forget how irritating she was in the dub of Final Fantasy X. For all that these elements appealed, however, the film falls down in far more respects. The animation is functional but the heavy use of CG is badly dated now in a way that the wildebeests in The Lion King never will be, having been too foregrounded. The design is too haphazard, feeling at times like the researchers just threw everything that suggested ‘ancient culture’ at the board to see what stuck. The animation is bizarrely careless for Disney – just look how the chalk that rubs off on Milo isn’t reversed as it should be. That story just has far too little brain to move anyone, and we’ve certainly seen the concept too many times already. The large cast don’t have time to be adequately developed or distinguished. Whoever thought of the Ireland/Iceland mistake doesn’t quite understand translation. And then there’s the fact that Milo, for all Michael J Fox tries hard, is deeply unlikeable. He’s too cocksure for an underdog, his clutziness seems affected mostly thanks to his animation, and there is zero chemistry between him and Kida. The best Disney films have a lot of heart, emotional turmoil that isn’t scared of crossing into cheesy territory, believable romance and some point of identification for the kids. The problem with Atlantis isn’t that anything is done drastically wrong, just that...well, nothing manages to stand out as superb either. Like you, I didn't watch Atlantis until after it came out when I rented it from the video store. I agree with you that it had some appealing things but couldn't make up for the bad elements. It's been many years since I watched it (and have little desire to see it again) but I remember finding some scenes good...but yeah, overall, not so great. The characters, especially the comical ones, just seemed like products of the time and they just didn't have that timeless, universally appealing humor that characters in other Disney films like Little Mermaid and Beauty and the Beast have. I remember renting Atlantis and Treasure Planet around the same time and felt the same about each, though I think I liked Treasure Planet a little better. By the way, my next couple of posts are going to be my top 20 favorite animated movies of all time. Thought you might be interested in that =) Though you'll probably disagree with a lot of them since you've seen way more animated films than I have (I've only seen Japanese and American ones pretty much). That sounds great! I'll be sure to check it out.